"The Patea River rises high on the eastern flank of Mount Egmont and flows inland to the western hills which turn it southwards on a sinuous course to the sea. Its lower, tidal waters form an estuary which, for almost a hundred years, was a harbour for little ships. The first Maori to inhabit the district built their Pa’s along the banks of the River and their fishing canoes harvested the rich fishing ground off Whitikau, their principal coastal village. Their large double canoes ventured as far south as Bluff to trade for mutton birds. The first European contact with the Patea coast probably came with the establishment of whaling settlements around Cook Strait in the 1820’s. Whales calved in ‘Motherly Bay’, the area between Kapiti Island and Cape Egmont, and there they were left undisturbed. EJ Wakefield recorded seeing them in great numbers basking outside the surf between the Manawatu and Patea Rivers. Late in 1840 Robert Stokes led a survey party from Wellington to Taranaki and wrote: ‘The entrance to the Patea is…sufficiently deep to admit vessels of fifty tons’. Charles Heaphy, draughtsman to the party, recorded that the river had been visited by small trading vessels. Two rival trading boats from Wanganui were wreaked trying to enter the Patea River early in 1841. The Wesleyan Mission had selected a site at Patea in 1840, and William Hough, a Wesleyan catechist, was stationed there in 1845 until ill-health forced his withdrawal in 1847. Travellers crossed the Patea River mouth at the government ferry station where a Maori man was paid £10 a year plus 5c per person and per horse for ferrying them across. However the outbreak of fighting in North Taranaki in 1860 effectively closed the district to Europeans. The harbour remained undeveloped. The Port of Patea had its beginnings when General Cameron, in command of the Imperial Troops, chose it as a base for the restoration of order in the Ngati Ruanui district in 1864. Until August 1866 Patea was purely a military settlement. Of a population of 900 only 20 were civilians. A little town of a dozen or so, mainly iron buildings, began to grow on the flat area at the western entrance and on the terrace above. A pontoon of empty casks and timber served as a landing. Some thought the withdrawal of the Imperial Troops would be the end of Patea, but the population began to increase rapidly. In May 1867 the buildings of the Imperial Forces were auctioned and some, including the Hospital, were converted into Stores. Patea was described as a dreary place, the river muddy and sand a constant nuisance. The site selected up River (Egmont St) for the permanent town was much better and the surrounding land was ‘one of the finest districts in New Zealand’. By August 1867 Ships were able to berth alongside a ‘nice little jetty’ and their crews could choose between Casey’s Shamrock Hotel and Campbells Royal Hotel. Titokowaru’s warriors went from their successful skirmish at Turuturumokai to the ambush of McDonnell’s troops at Te Ngutu o te Manu where von Tempsky was killed in 1868. Colonel McDonnell resigned to be replaced by Colonel Whitmore but in the meantime soldiers and settlers withdrew to Patea which could only be reached from Wanganui by sea. In the 4 ½ years of intermittent fighting the little ships which entered Patea had played an important supporting role. In the first campaign they had shortened the supply line of the Imperial forces by 40 miles. They had nurtured the infant settlement of 1866-67; and when fighting was resumed they had provided the only safe link with the rest of the country. Officially the Port of Patea was proclaimed on 21 February 1871. In April the Taranaki Provincial Council appointed Alfred Wood first Harbourmaster. Lighthouse dues of ½d per ton were introduced, and James Hirst was permitted to begin construction of a forty-foot jetty, with five feet of water at the foot of Norfolk Street, on York St. Nearer Essex St John Milroy erected a pier in 1875. 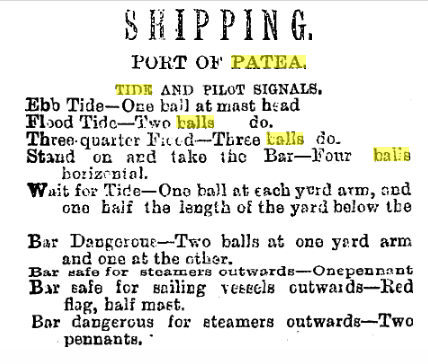 A group of Patea merchants now entered the shipping business. Taplin, Muir and Gibson joined with JB Tilley, former master of the Patea, to purchase the 26 ton schooner ‘Kate’. The Patea Harbour Board was established in 1876, with its four members nominated by the government, GF Sherwood, Captain Wray, W Williams, John Milroy. On its second meeting it was decided to erect the eastern breakwater. The Boards only asset was 3000 acres of land endowment which was sold to raise finance. Before work commenced eminent English Engineer Sir John Coode, visited. His recommendation of the line the breakwater should follow was adopted. ​In June 1878 Sherwood laid the foundation stone for the breakwater, & addressed the large crowd gathered, his words were well chosen ‘One half of our lives are spent in wondering if a thing can be done and the other half in wondering why it was not done before’. The Patea Steam Shipping Company was also formed in 1878. The Company’s first steamer was the 79 ton, 83 feet long, steamer ‘Patea’ which arrived in Patea in February 1879, and served the township for many years. ‘Patea’ carried 20 passengers and offered them an overnight service to Wellington, returning the next evening. Her arrivals & departures were always treated as occasions by the settlers. Special Christmas excursions to the Marlborough Sounds were advertised at £4 a ticket. The ‘Town Wharf’ was constructed in 1881, off York Street. By the turn of the century it had been extended as the sheep industry prospered, and the Storage Shed for Wool bales enlarged with a second wool dumping plant installed. The steamer ‘Waverley’ was also acquired by the Company in 1883 and later the 'Wakatu'. The Patea Steam Shipping Company went into voluntary liquidation in August 1886. A second Patea Shipping Company was formed in 1897, they purchased the steamers 'Kiripaka' and 'Kapiti'. In 1912 this was taken over by the West Coast (Dairy) Refridgeration Company, and became the South Taranaki Shipping Company. They carried on Dairy Produce export to Wellington in the ships 'Mana', 'Kiripaka', 'Kapuni' and 'Hawera'. Later ships to join the fleet were: 'Inaha', 'Foxton', 'Tairoa'. In March 1879 W Aitchison was given the contract to erect a lighthouse at the heads 130 feet above the river. This burnt down in February 1889 and was replaced by McCarty & Hunger. This was later replaced by 'Time Balls'. Hirst & Milroy’s wharves were taken over by the Harbour Board in 1879. By 1883 the Railway had come and made a large impact on Patea, but it did not make the port redundant, as had been suggested a few years earlier. The Railway Wharf was opened in 1883. In 1884 Patea was finally declared a port of entry and the Customs Office opened in August. The district was then in a depression caused by the fall in wool prices. Thompson drew up plans for a western breakwater in 1883 but the Harbour Board had no money. In 1890 meetings were held and a new ‘Patea Shipping Company’ was proposed. In October 1897 work began on a ‘guide pier’, a temporary measure until the Western Breakwater Wall could be built. The pier was constructed of totara and steel. Ships no longer had to wriggle & zigzag their way into the river. ​Finally, twenty five years after Sir John Coodes report, the Harbour Board decided to erect the western breakwater. Mr Leslie Reynolds was engaged to design the work and a loan of £20,000 was raised. A public ceremony of the laying of the first block was held in November 1903. Seven-ton blocks proved too light and fourteen-ton blocks had to be used. Lack of finance delayed the work but it was completed by October 1905. In 1899 deputations to Wellington, submissions to the Dept of Agriculture and meetings throughout the district resulted in Patea being declared a butter grading Port, despite opposition of New Plymouth. South Taranaki Dairy companies formed a co-operative grading firm, the ‘West Coast Refrigeration Company’. In 1901 a site down river from the Railway Wharf was chosen for the Cool Stores, and the Harbour Board offered to provide a wharf alongside. In 1902 1,791 tons of dairy produce were exported worth £338,964". This is just the beginning of the Story of the Ships that came & went from Patea’s Port. The growth of the Dairy trade and the Freezing Works added layers to its value, and stories that keep those days alive.